The Garden Club of Rogers recognized a long time member of the club with a reception Feb. 5, 2019. Rosemary Bassham has been a member of the Rogers Garden Club for 25 years. 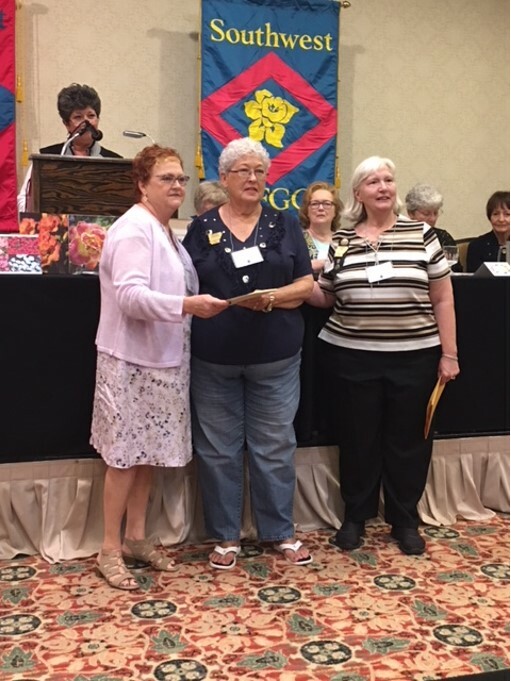 The Arkansas Federation of Garden Clubs (AFGC) awards a Circle of Roses pin and a certificate to those members who have participated for 25 years. The club also presented Rosemary with a beautiful arrangement of red roses designed by Barbara Spears, the club’s artistic design chairperson. Rosemary was a very active member, serving on many committees over the years. She opened her home to the club on more than one occasion, for flower shows and such. She still attends meeting regularly. “Rosemary has been a valuable member of our Club. We are proud to call her friend,” said Marge Leonard GCR President. 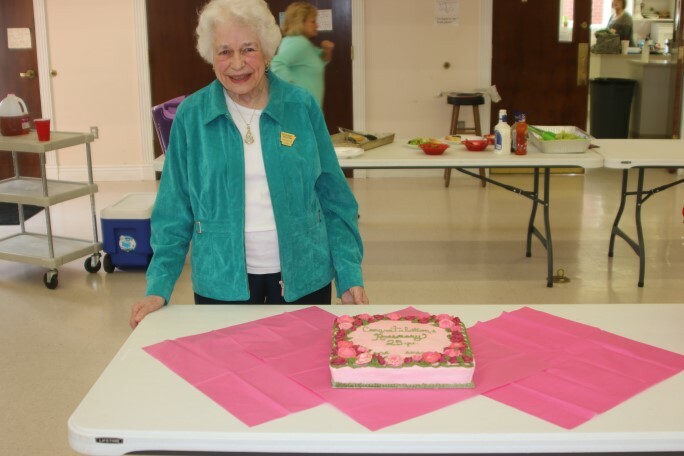 Pictured is Rosemary Bassham with her Circle of Roses cake. The Garden Club of Rogers will resume its monthly general meetings on Tue. Feb. 5, 2019, at 10:30, at the First Presbyterian Church, located at 26th. Street and New Hope, in Rogers. The program will be “Natural Resources” Speaker will be Mark Clippinger, Park Superintendent, Hobbs State Park. Mark well certified in search and rescue, emergency medicine, critical incidents, water and rope rescue and wild land firefighting, etc. Mark will have literature for us. Other activities will include a horticulture report and drawing for Plant of the Month, Pass along plants and magazines also. We will carpool from the Dollar General at Hwy 62/94. Leaving at 9:30am. This is a hands-on workshop. There is no cost for the workshop, but bring your wallet. 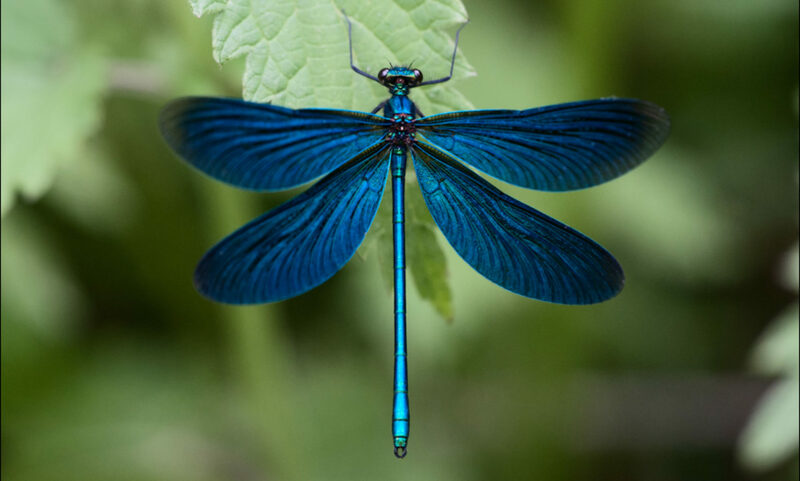 Costs incurred will be for container, plants and fairy accessories, it will all depend on what you buy. I would plan on spending $50 and up. The possibilities are endless! This will be a dish type Fairy Garden. Debbie Main and Sherrie Eoff attended this workshop in November and had a great time. and will be held in one of Perennials Etc’s greenhouses, so plan to dress accordingly. There will be hot chocolate and snacks. We can discuss lunch plans later. If you know you want to attend, please contact me by email, text or even call. If you have any questions, please contact Sherrie Eoff. If you would like to see what Debbie and Sherrie made, Sherrie can email or text you pics. The Garden Club of Rogers host many activities throughout the year, in the community. One of these is Youth Gardening, with The Pre K class in the Rogers School District. In October our Junior Gardening Committee taught the children how to make Chia People. There are about 120 students in 6 classes. The Club works with 3 classes a day. We spend 2 mornings a month with them. They really enjoy the Garden Club Ladies, and look forward to seeing us, We have other projects throughout the School year. In December we make Christmas cards from discarded cards. We furnish other themes for those that don’t celebrate Christmas. The cards are distributed to Nursing Homes. Our regular monthly meetings will resume on Feb. 5, at 10:30, at the First Presbyterian Church in Rogers, at the corner of New Hope and 26th. Street. For more information please call Ronna Precure at 479-644-9673. 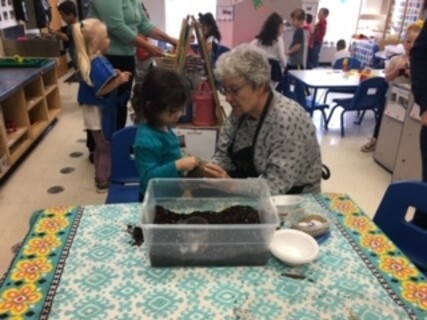 GCR member Sue Mank helps student make a chia people. 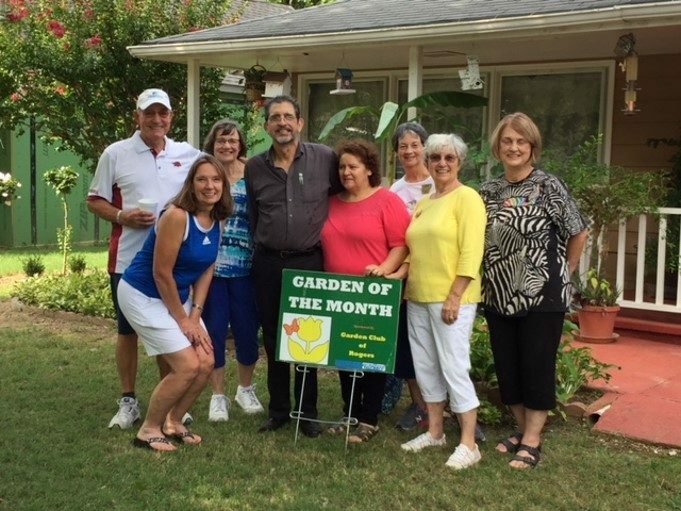 The Garden Club of Rogers closed out its Garden of the Month project in September. The Garden of the Month Contest runs May thru September. Septembers winners were Silvester and Ofilia Duran, 114 S. 15th Street in Rogers. The yard represents years of work and dedication and the producing fruit trees, a fig bush and pineapple plants are some of the results. There are lots of other lovely and interesting plants. As winner they receive a Bradford Yard Living and landscape gift certificate, and a Garden Club of Rogers set of coffee mugs. A Garden of the Month sign is placed in their yard proclaiming the winner’s garden as Garden of the Month, and remains there for a month. The Garden of the Month Contest is open to any personal residence with a Rogers mailing address, and promotes beautification of neighborhoods. Monday June 4…Kick off for our National Garden Week. We need vases that you don’t want back and any flowers from your yard that you are willing to share. We will design bouquets and deliver them to several businesses in Rogers. We will also design centerpieces for Tuesday’s general meeting. Pictured from L to R are Arkansas Federation of Garden Clubs, President, Derenda Stanley, Debbie Main, and NW Regional Director, Burnie Ott. A group from the Garden Club of Rogers attended the Arkansas Federation of Garden Clubs, State Convention in Hot Spring, AR, April 2-3 . 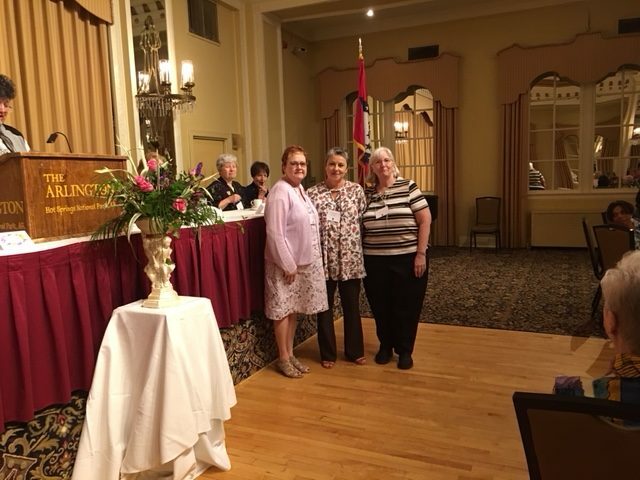 Those attending were club President Marge Leonard, State Awards Chairman (from Garden Club of Rogers) Ronna Precure, Club members Phyllis Stair and Debbie Main. Also from the Garden Club of Rogers, Sue Mank, State Historian and Burnie Ott NW Regional Director. The Garden Club of Rogers accepted many awards for various projects. A special lifetime award was awarded to one member. Debbie Main received The Lifetime Achievement Award for her service to the Garden Club of Rogers. She has served the club in many areas to include club president, secretary, treasurer, garden of the month committee chairman, and national garden week committee chairman to name a few. Debbie had to be nominated by the club president, presented to the Arkansas Federation of Garden Clubs, State Board of Directors, and approved by the board. She was presented the award at the state convention, it was a complete surprise to her. AFGC President, Derenda Stanley, presents GCR President Marge Leonard, and NW Arkansas Regional Director Burnie Ott an award for collecting the most pop tabs in the state. GCR collected 270 pounds of pop caps. Proceeds from the sale of the pop tabs go to support the local Ronald McDonald House. If you are interested in joining GCR, please contact Ronna Precure at 479-644-9673. GCR will hold its 43rd Annual Plant Sale April 21, from 8 a.m. to noon. This year the sale will be located at the First Presbyterian Church, 1901 S. 26th Street Rogers, AR 72758, located on the southeast corner of New Hope and 26th Street. This sale is the main fundraiser for the garden club. The funds go to youth education, civic beautification and horticulture scholarships. If you have plants you would like to donate, please contact Sherrie Eoff at (479) 903-5389 or email her at skeoff@hotmailcom. GCR has volunteers who will come and dig donated plants or pick them up from your home. If you’re looking for great prices on plant that are for sale, please join GCR members for the sale and just talk about plants and gardening. There will also be a bake sale at the event. We hope to see you there. The Garden Club of Rogers sponsors the Keeta Arnold Memorial Horticulture Scholarship. The purpose of the scholarship is to offer financial aid to students majoring in Horticulture related subjects. This scholarship honors the memory of long time garden club member, mentor, high school counselor, teacher and gardener, Keeta Arnold. The scholarship is awarded yearly in the amount of $500 and is available to college junior, seniors, and graduate students pursuing a Master’s Degree. Student must be attending an accredited college or university, be a legal resident of Arkansas, be attending school full-time, and have a cumulative GPA of at least 3.25.